Cremation of the dead is perhaps the most important — and often the most colorful — ritual of Balinese Hinduism. A cremation is necessary to liberate the soul of the deceased for the passage into heaven and reincarnation. Due to the cost and the complicated preparations, cremations often occur long after the death of the person. Group cremations are sometimes held in order to share the expenses. Between death and cremation the body is buried in the cemetery. During this time, the soul of the deceased is thought to be agitated and longing for release. An auspicious day for the cremation is chosen by a priest after conculting the Balinese calendar. Preparations begin long before the appointed day. A large tower of bamboo and paper, extravagantly painted according to the caste and wealth of the deceased, is constructed. On the morning of the cremation, relatives and friends of the deceased visit and pay their last respects. 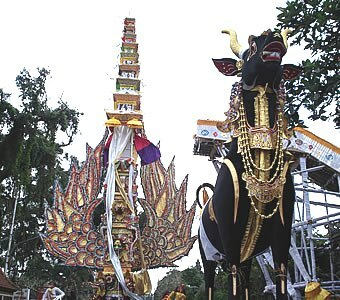 At midday the body is carried in the tower to the graveyard by members of the dead man’s banjar. This becomes a loud, noisy, and boisterous procession designed to confuse the soul of the deceased so that it wiil lose its way and not be able to return to the family compound. At the cremation site a priest officiates and the fires are lit. Another raucous procession carries the ashes to the nearest body of water for disposal. This represents the cleansing and disposal of the material body and is cause for singing and laughing. Later, there are private ceremonies for the care of the soul. The status of reborn soul relates to the person’s karma, or his conduct in previous lives. In general, the Balinese feel that the soul is reborn within the same circle of blood relations.